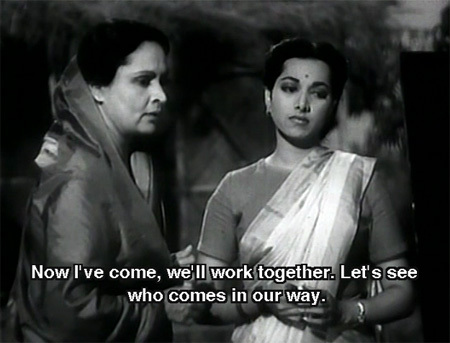 One of the best things about Hindi movies for me is that they are a window into the growing pains—and hopes and joys—of a brand new nation. (I’m talking mostly about north India only since I don’t watch south Indian movies yet, but still. It’s there, in front of you.) 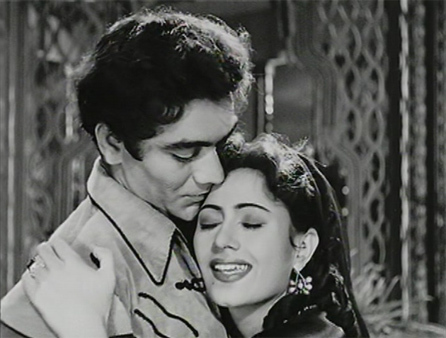 Most cinema is reflective of its origins and time to some extent of course; but the timing of India’s independence, and the fledgling country’s tenacious adherence to specifically Indian traditions and issues, makes Hindi cinema particularly so (this is also true of the pre-independence period, although in a more veiled way). For this reason, I try to slog my way through the 1940s, although I find films from the era sometimes a little too melodramatic and preachy, and a little too song-saturated, to make it easy. But I really enjoyed this one! It’s feminist! Chock-full of woman power, seriously! Sure, it’s heavy-handed (and laughably idealistic if one is a wee bit cynical), but it has such charm and youthful optimism (that same unknown cynic might call it naivete) that I got sucked right in. Plus, the incredibly young Dev Anand and Madan Puri are so…incredibly young! This was a pretty good movie until the last half hour, when a different bad film was tacked onto it. Such is life. At least the bad one was only half an hour long. 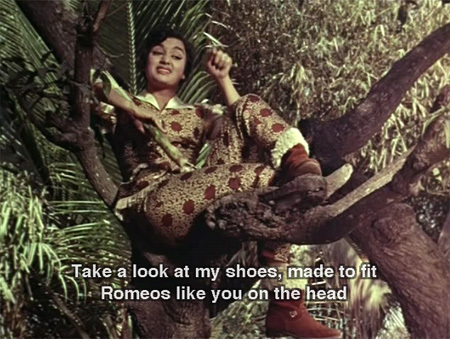 Until then, I was enjoying an interesting story with eye-searing ’70s style and the yummy goodness of young Amitabh, Shatrughan Sinha and our homegirl, Laxmi Chhaya. She got third billing after those two, and although strictly speaking she wasn’t the heroine, she had a central role and she was fantastic. Why was she not a star, why? Sigh. The makers of Life…In A Metro apparently saw this film at some point, because one of the story threads in that was lifted from this (either that, or lending your boss the key to your apartment so he can cheat on his wife is a common practice in India—please say it isn’t so! ).